Designer Whey Full Spectrum Peptides: (GMO-Free & rBGH-Free Whey Protein Concentrate, GMO-Free & rBGH-Free Whey Protein Isolate, L-Glutamine, L-Leucine, Taurine, L-Phenylalanine), Digestive Health Blend: [GMO-Free Prebiotic Vegetable Fiber, Probiotics: (Lactobacillus Acidophilus, B. Longum, L. Plantarum), Vegetarian Protease Enzymes], Alkalized Cocoa, Natural Coffee Flavor, Natural Mocha Flavor, Sunflower Lecithin, Electrolyte Blend: (Calcium Phosphate, Magnesium Oxide), Dried Cream Extract, B-Vitamin Blend: (Calcium Pantothenate, Pyridoxine Hydrochloride, Thiamin Mononitrate, Riboflavin), Zinc Gluconate, Stevia Leaf Extract, Xanthan Gum, Sodium Alginate, Monk Fruit, Mixed Tocopherols, Vitamin D3 (Cholecalciferol). (Calcium Pantothenate, Pyridoxine Hydrochloride, Thiamin Mononitrate, Riboflavin), Zinc Gluconate, Xanthan Gum, Sodium Alginate, Stevia Leaf Extract, Monk Fruit, Mixed Tocopherol, Vitamin D3 (Cholecalciferol). *This Prebiotic Vegetable Fiber Contains 2 Calories/Gram Unlike Digestible Carbohydrates Which Contains 4 Calories/Gram. Combine one scoop with 6 to 8 oz of cold water or milk (skim or your own favorite non-dairy) and mix thoroughly. Designer Whey Full Spectrum Whey Peptide Blend (whey protein concentrate, whey protein isolate, L-glutamine, taurine, L-leucine, L-phenylalanine), erythritol, natural vanilla flavor, whey minerals, soy lecithin, magnesium oxide, citrus fiber, inulin, zinc gluconate, xanthan gum, sodium alginate, salt, stevia leaf extract, calcium pantothenate, pyridoxine hydrochloride, thiamin mononitrate, riboflavin, cinnamon, annatto, mixed tocopherols (to help protect flavor), vitamin D3 (cholecalciferol). Contains milk and soy products. 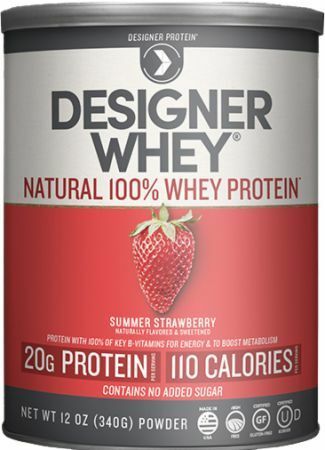 Combine 1 scoop of Designer Whey with 8 fl oz (or less for more flavor) of cold water, juice or milk and mix thoroughly. Best Times To Use: Take first thing in the morning to kick start your metabolism. Take 20 minutes after a workout to help recover and build muscle. Take mid-morning or mid-afternoon to curb cravings. Contains milk. Manufactured in a facility that also produces soy products. *** The prebiotic vegetable fiber contains 2 calories/gram unlike digestible carboydrates which contain 4 calories/gram. Directions For Use For a delicious, low calorie snack, or a post-workout recovery drink, mix one scoop with 6 oz. cold water or milk (skim or your favorite non-dairy). For a great-tasting smoothie, blend with healthy ingredients such as Greek yogurt, fruits & veggies. Quickest - Add 1 scoop to 3 oz of water and mix with a spoon. Enjoy. Designer Whey Full Spectrum Peptides: (rBGH-Free Whey Protein Concentrate, rBGH-Free Whey Protein Isolate, L-Glutamine, L-Leucine, Taurine, L-Phenylalanine), Digestive Health Blend: [Non-GMO Prebiotic Vegetable Fiber, Probiotics: (Lactobacillus Acidophilus, B. Longum, L. Plantarum), Vegetarian Protease Enzymes], Natural Flavors, Sunflower Lecithin, Electrolyte Blend: (Calcium Phosphate, Magnesium Oxide), B-Vitamin Blend: (Calcium Pantothenate, Pyridoxine Hydrochloride, Thiamin Mononitrate, Riboflavin), Zinc Gluconate, Xanthan Gum, Sodium Alginate, Stevia Leaf Extract, Monk Fruit, Annatto, Mixed Tocopherols, Vitamin D3 (Cholecalciferol). Combine one scoop with 6 to 8 oz of cold water or milk (skim or your favorite non-dairy) and mix thoroughly. Designer Whey Full Spectrum Peptides: (GMO-Free & rBGH-Free Whey Protein Concentrate, GMO-Free & rBGH-Free Whey Protein Isolate, L-Glutamine, L-Leucine, Taurine, L-Phenylalanine), Digestive Health Blend: [GMO-Free Prebiotic Vegetable Fiber, Probiotics: (Lactobacillus Acidophilus, B. Longum, L. Plantarum), Vegetarian Protease Enzymes], Natural Flavor, Sunflower Lecithin, Electrolyte Blend: (Calcium Phosphate, Magnesium Oxide), B-Vitamin Blend: (Calcium Pantothenate, Pyridoxine Hydrochloride, Thiamin Mononitrate, Riboflavin), Natural Vanilla Flavor, Zinc Gluconate, Stevia Leaf Extract, Xanthan Gum, Sodium Alginate, Monk Fruit, Mixed Tocopherols, Vitamin D3 (Cholecalciferol). (calcium pantothenate, pyridoxine hydrochloride, thiamin mononitrate, riboflavin), zinc gluconate, xanthan gum, sodium alginate, stevia leaf extract, cinnamon, annatto, monk fruit, mixed tocopherols, vitamin D3 (cholecalciferol). Contains Milk. The prebiotic vegetable fiber contains 2 calories/gram unlike digestible carbohydrates which contain 4 calories/gram. Combine one scoop with 6 to 8 oz. of cold water or milk (skim or your favorite non-dairy) and mix thoroughly. (calcium pantothenate, pyridoxine hydrochloride, thiamin mononitrate, riboflavin), zinc gluconate, xanthan gum, sodium alginate, stevia leaf extract, monk friut, mixed tocopherols, vitamin D3 (cholecalciferol). *The Prebiotic Vegetable Fiber contains 2 Calories/Gram unlike Digestible Carbohydrates which contain 4 calories/Gram. Designer Whey Full Spectrum Peptides (rBGH-free whey protein concentrate, rBGH-free whey protein isolate, L-glutamine, L-leucine, taurine, L-phenylalanine), Digestive Health Blend: [Non-GMO prebiotic vegetble fiber*, Probiotics (lactobacillus acidophilus, B. longum, L. plantarum), vegetarian protease enzymes], sunflower lecithin, Electrolyte Blend: (calcium phosphate, magnesium oxide), dried cream extract, B-Vitamin Blend: (calcium pantothenate, pyridoxine hydrochloride, thiamin mononitrate, riboflavin), zinc gluconate, mixed tocopherols, vitamin D3 (cholecalciferol). (calcium pantothenate, pyridoxine hydrochloride, thiamin mononitrate, riboflavin), zinc gluconate, xanthan gum, sodium alginate, stevia leaf extract, monk fruit, mixed tocopherols, vitamin D3 (cholecalciferol). Combine 1 scoop of Designer Whey with 6 to 8 fl oz of cold water, milk (skim or your favorite non-dairy) and mix thoroughly. (calcium pantothenate, pyridoxine hydrochloride, thiamin mononitrate, riboflavin), zinc gluconate, xanthan gum, sodium alginate, stevia leaf extract, monk fruit, annatto, mixed tocopherols, vitamin D3 (cholecalciferol). Contains Milk. Manufactured in a facility that also processes soy products. The prebiotic vegetable fiber contains 2 calories/gram unlike digestible carbohydrates which contain 4 calories/gram. Combine one scoop with 6 to 8 oz. of cold water or milk (skim or your favorite non-dairy) and mix thoroughly. A scoop is included in this container. Designer Whey Full Spectrum Whey Peptides (rBGH-FREE Whey protein concentrate, rBGH-FREE whey protein isolate, L-Glutamine, L-Leucine, Taurine, L-Phenylalanine), digestive health blend: [Non-GMO prebiotic vegetable fiber, probiotics: (lactobacillus acidophilus, b. longum, l. plantarum) vegetarian protease enzymes] natural flavors, sunflower lecithin, electrolyte blend: (calcium phosphate, magnesium oxide), beet powder, citric acid, adipic acid, dried cream extract, b-vitamin blend: (calcium pantothenate, pyridoxine hydrochloride, thiamin mononitrate, riboflavin], zinc gluconate, xanthan gum, sodium alginate, stevia leaf extract, monk fruit, mixed tocopherols, vitamin D3 (cholecalciferol). Combine one scoop with 6 to 8 oz. of cold water or milk (skim or your favorite non dairy) and mix thoroughly. ALLERGEN WARNING: Contains milk. Do not use in diets supplying less then 400 calories per day without medical supervision. High quality, natural whey-based proteins and meal replacements from the protein experts – pioneers of the first whey protein powder in 1993. Designed to support fitness, weight management, body strength and performance goals. Only 110 calories. No added sugar. Certified Gluten-free and Kosher.